- newmanlib. ibri. 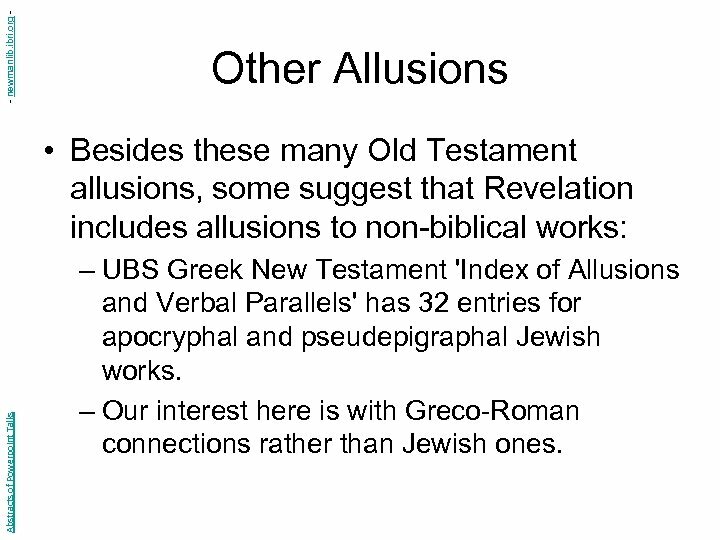 org - Other Allusions Abstracts of Powerpoint Talks • Besides these many Old Testament allusions, some suggest that Revelation includes allusions to non-biblical works: – UBS Greek New Testament 'Index of Allusions and Verbal Parallels' has 32 entries for apocryphal and pseudepigraphal Jewish works. 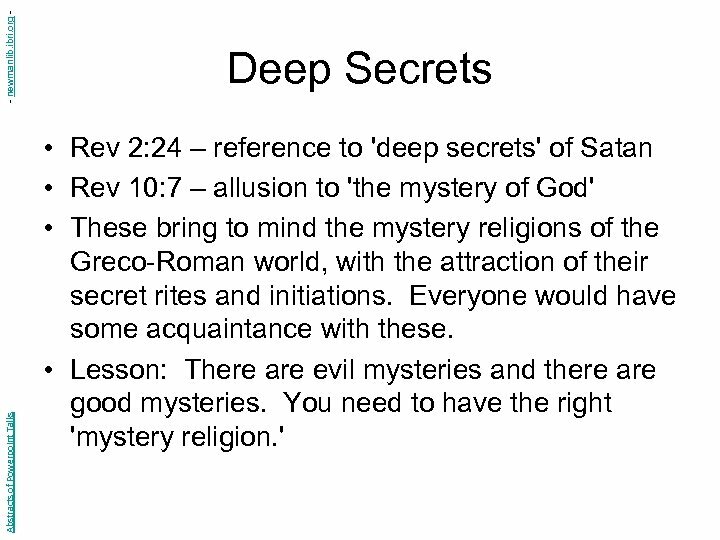 – Our interest here is with Greco-Roman connections rather than Jewish ones. - newmanlib. ibri. 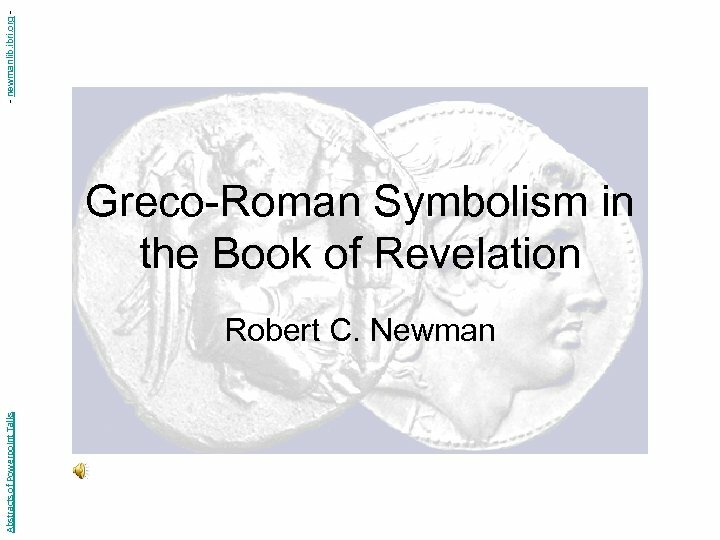 org - Greco-Roman Allusions Abstracts of Powerpoint Talks • William M. Ramsay has found a number of these in the letters to the seven churches (Rev 2 -3). 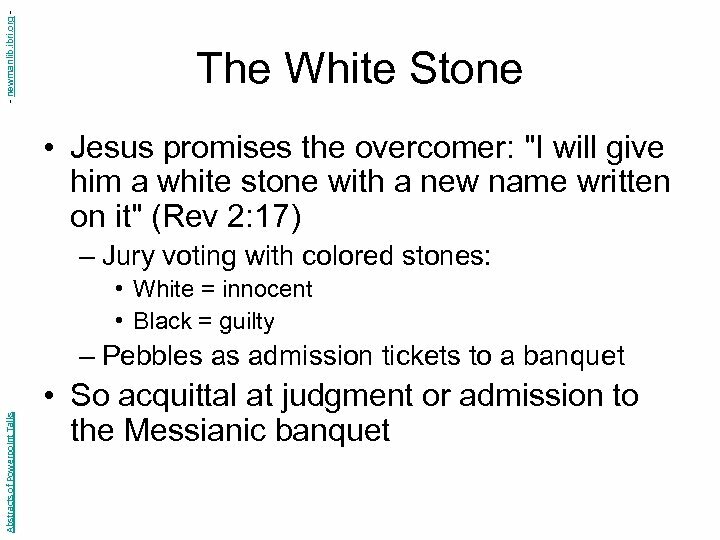 Some examples: – Sardis was never taken by storm, but only by stealth at night (cp Rev 3: 3): (NIV) Remember, therefore, what you have received and heard; obey it, and repent. But if you do not wake up, I will come like a thief, and you will not know at what time I will come to you. 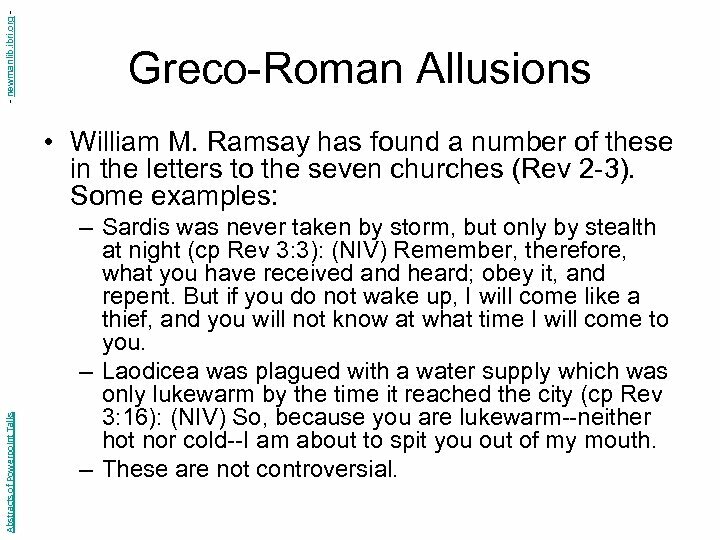 – Laodicea was plagued with a water supply which was only lukewarm by the time it reached the city (cp Rev 3: 16): (NIV) So, because you are lukewarm--neither hot nor cold--I am about to spit you out of my mouth. – These are not controversial. - newmanlib. ibri. 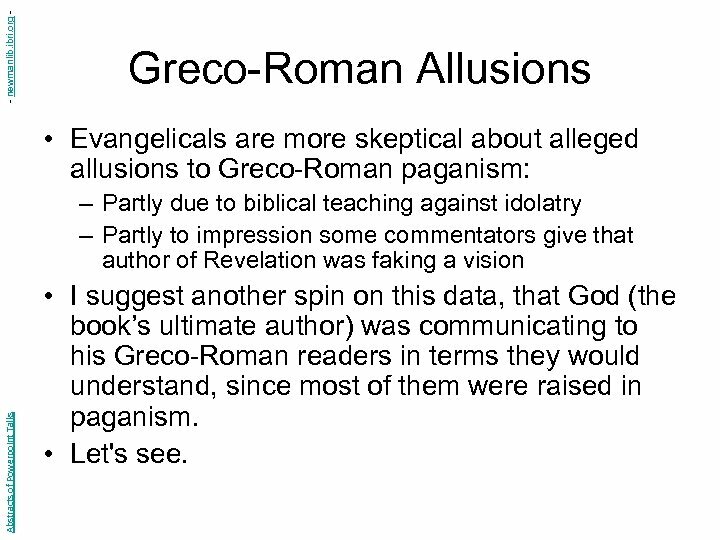 org - Greco-Roman Allusions • Evangelicals are more skeptical about alleged allusions to Greco-Roman paganism: Abstracts of Powerpoint Talks – Partly due to biblical teaching against idolatry – Partly to impression some commentators give that author of Revelation was faking a vision • I suggest another spin on this data, that God (the book’s ultimate author) was communicating to his Greco-Roman readers in terms they would understand, since most of them were raised in paganism. • Let's see. - newmanlib. ibri. 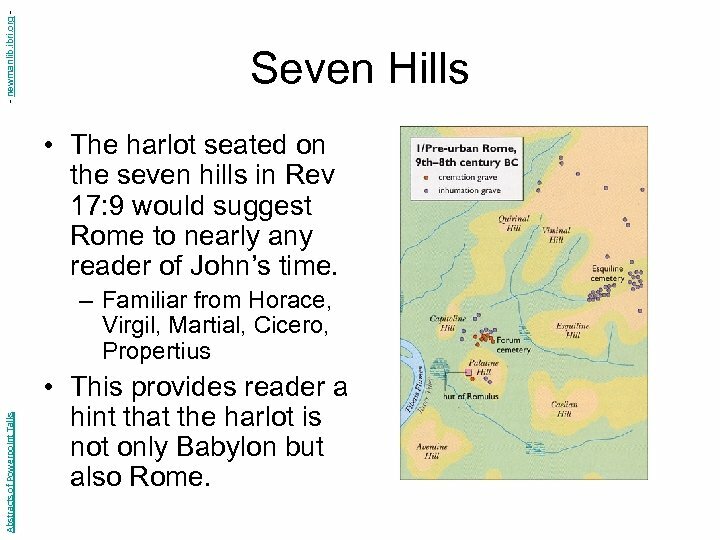 org - Seven Hills • The harlot seated on the seven hills in Rev 17: 9 would suggest Rome to nearly any reader of John’s time. 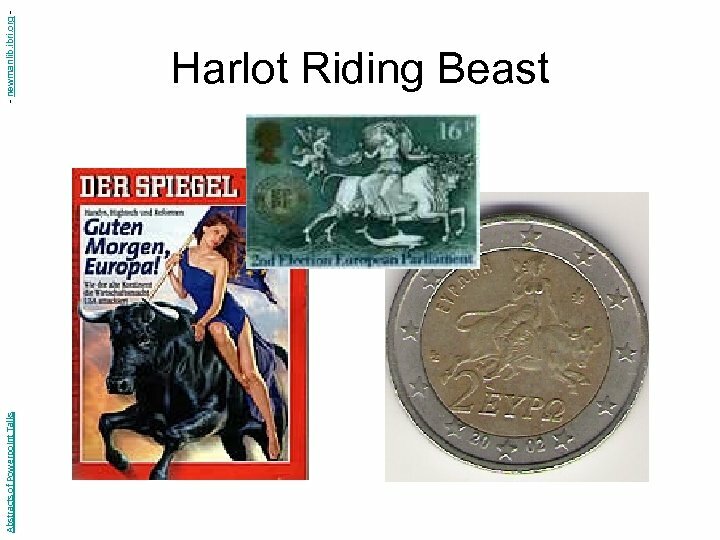 Abstracts of Powerpoint Talks – Familiar from Horace, Virgil, Martial, Cicero, Propertius • This provides reader a hint that the harlot is not only Babylon but also Rome. - newmanlib. ibri. 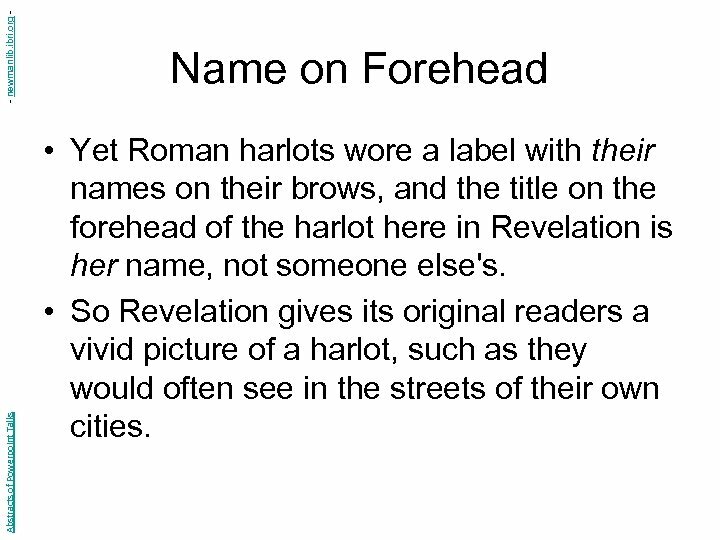 org Abstracts of Powerpoint Talks Name on Forehead • Yet Roman harlots wore a label with their names on their brows, and the title on the forehead of the harlot here in Revelation is her name, not someone else's. • So Revelation gives its original readers a vivid picture of a harlot, such as they would often see in the streets of their own cities. - newmanlib. ibri. 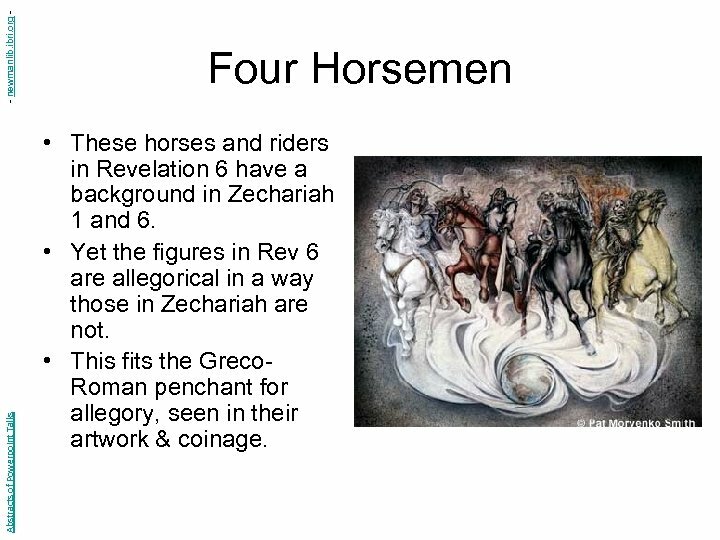 org Abstracts of Powerpoint Talks Four Horsemen • These horses and riders in Revelation 6 have a background in Zechariah 1 and 6. 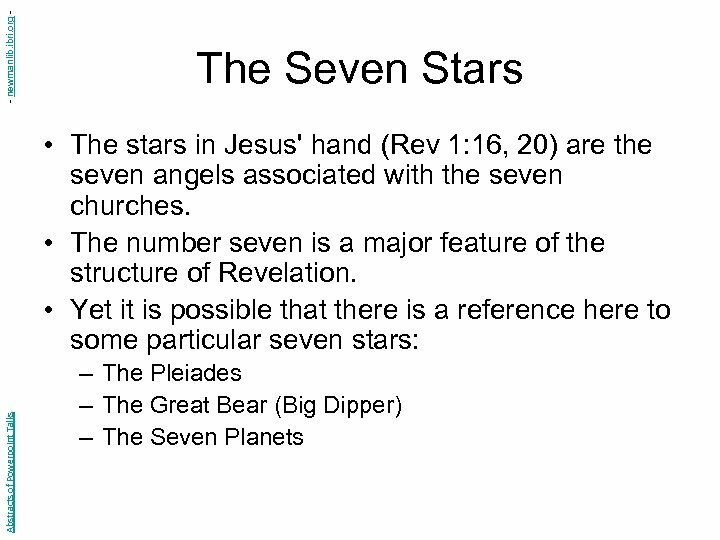 • Yet the figures in Rev 6 are allegorical in a way those in Zechariah are not. 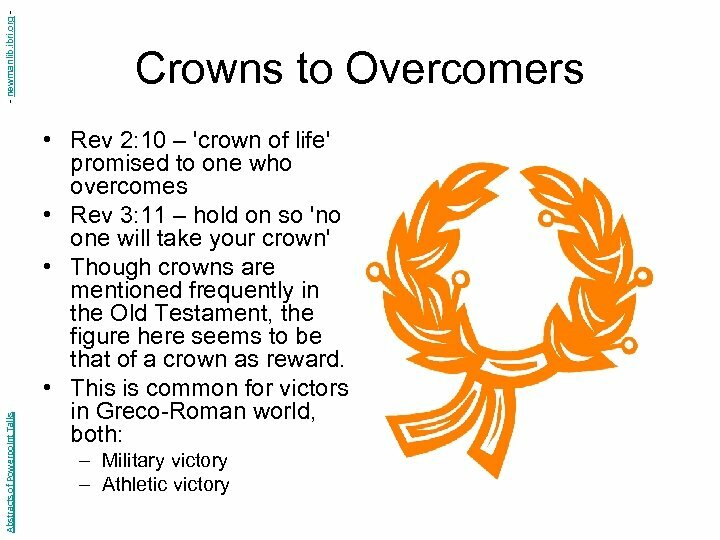 • This fits the Greco. 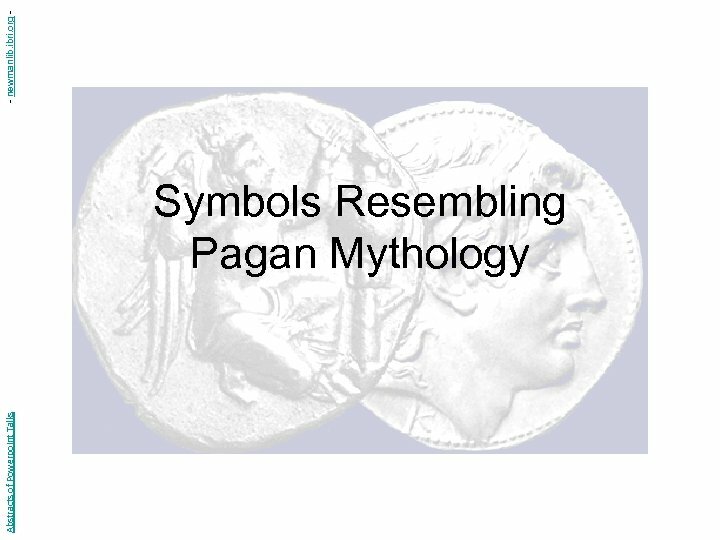 Roman penchant for allegory, seen in their artwork & coinage. - newmanlib. ibri. 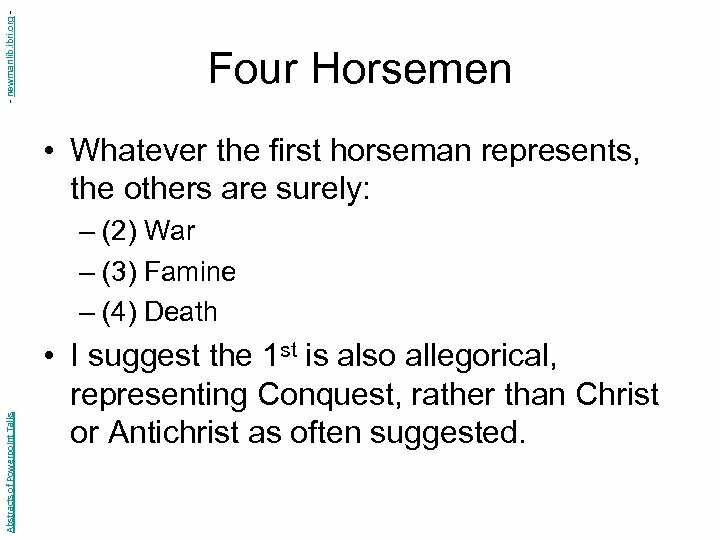 org - Four Horsemen • Whatever the first horseman represents, the others are surely: Abstracts of Powerpoint Talks – (2) War – (3) Famine – (4) Death • I suggest the 1 st is also allegorical, representing Conquest, rather than Christ or Antichrist as often suggested. - newmanlib. ibri. 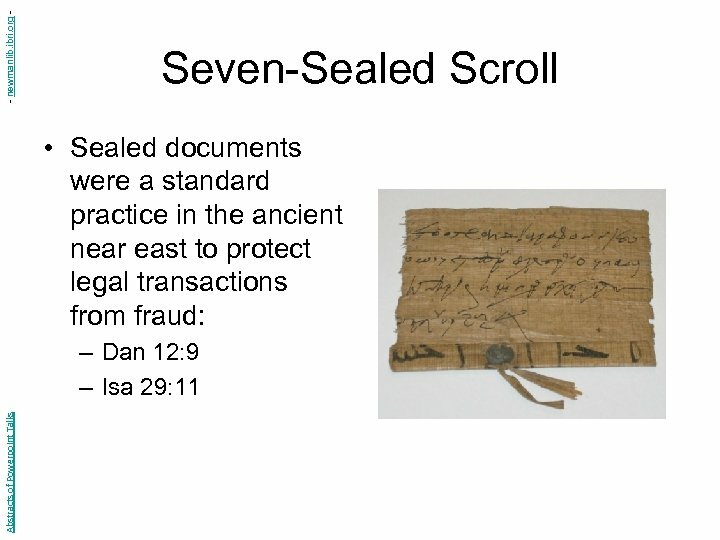 org Abstracts of Powerpoint Talks Seven-Sealed Scroll • But seven seals has no OT background, whereas Roman wills and some other legal documents were typically sealed with seven seals. 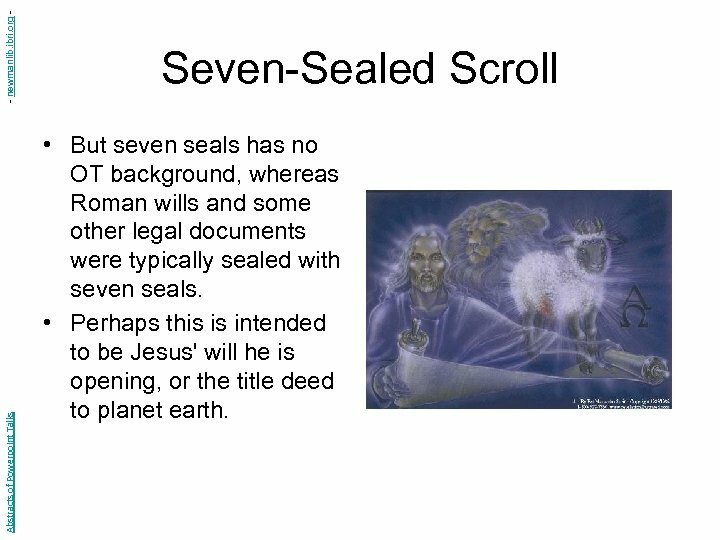 • Perhaps this is intended to be Jesus' will he is opening, or the title deed to planet earth. - newmanlib. ibri. 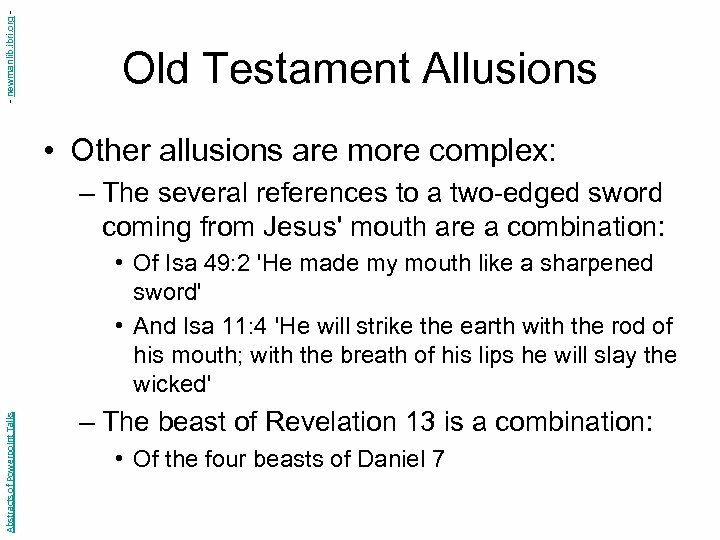 org - He Who Is… Abstracts of Powerpoint Talks • The triple characterization of God (who is, was, and is to come) seen in Rev 1: 4, 8; 4: 8, with a shorter double version in 11: 17 and 16: 5, clearly has roots in God’s revelation to Moses in Ex 3: 14. 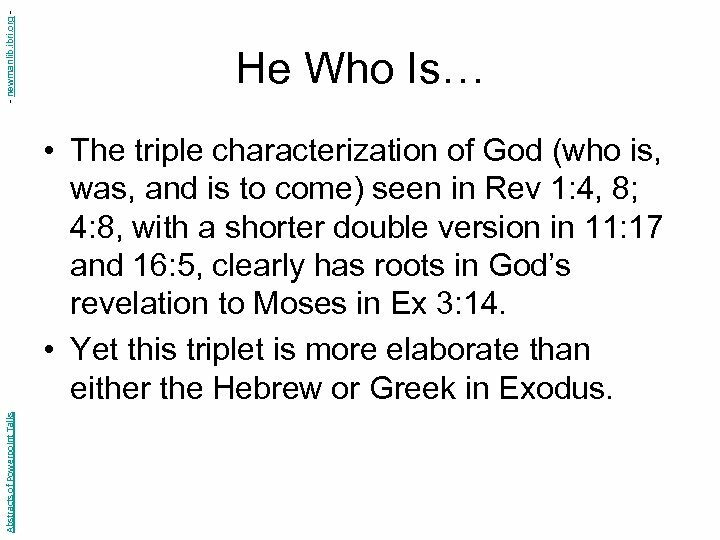 • Yet this triplet is more elaborate than either the Hebrew or Greek in Exodus. - newmanlib. ibri. 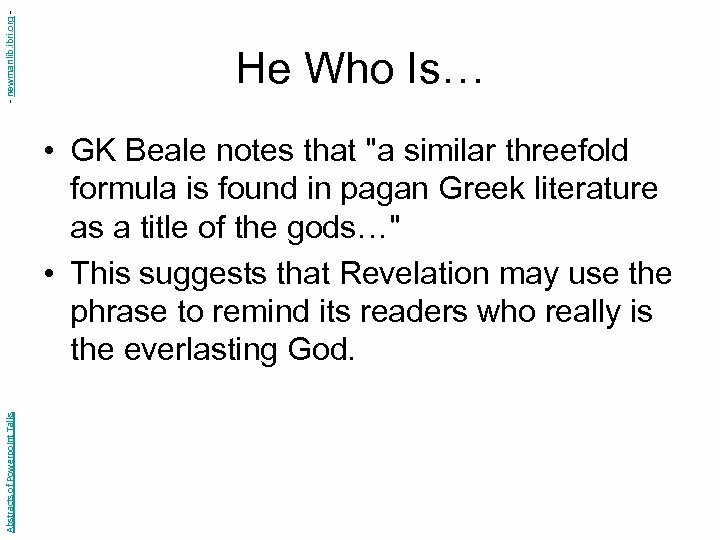 org - He Who Is… Abstracts of Powerpoint Talks • GK Beale notes that "a similar threefold formula is found in pagan Greek literature as a title of the gods…" • This suggests that Revelation may use the phrase to remind its readers who really is the everlasting God. - newmanlib. ibri. 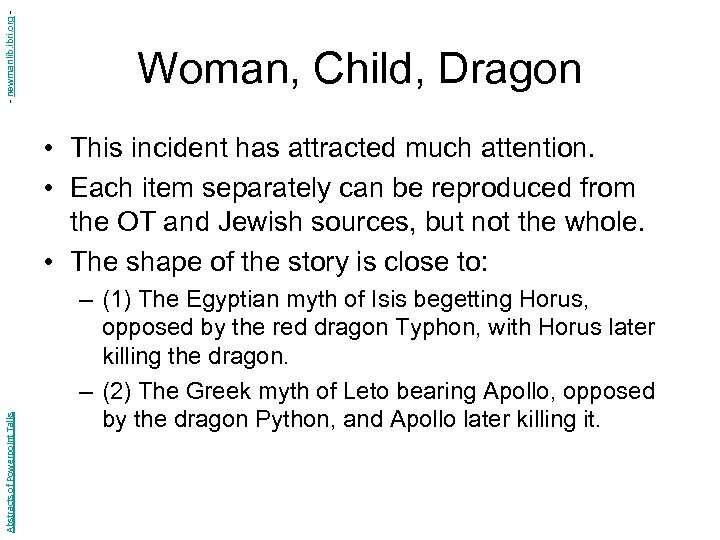 org - Woman, Child, Dragon Abstracts of Powerpoint Talks • This incident has attracted much attention. 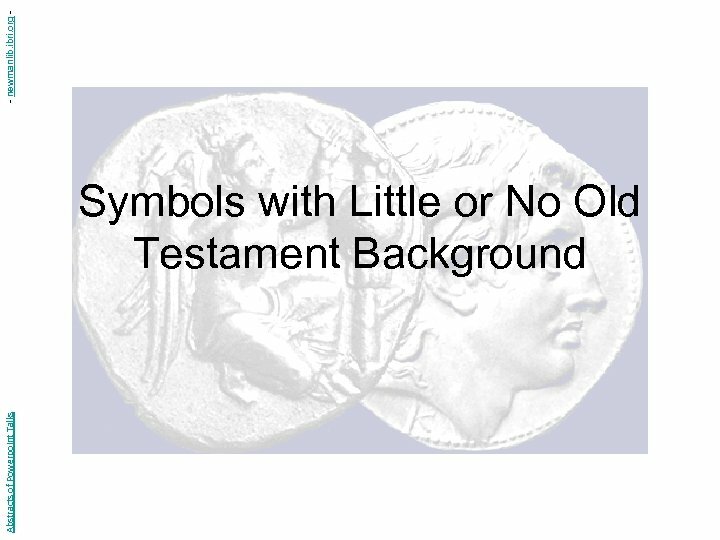 • Each item separately can be reproduced from the OT and Jewish sources, but not the whole. 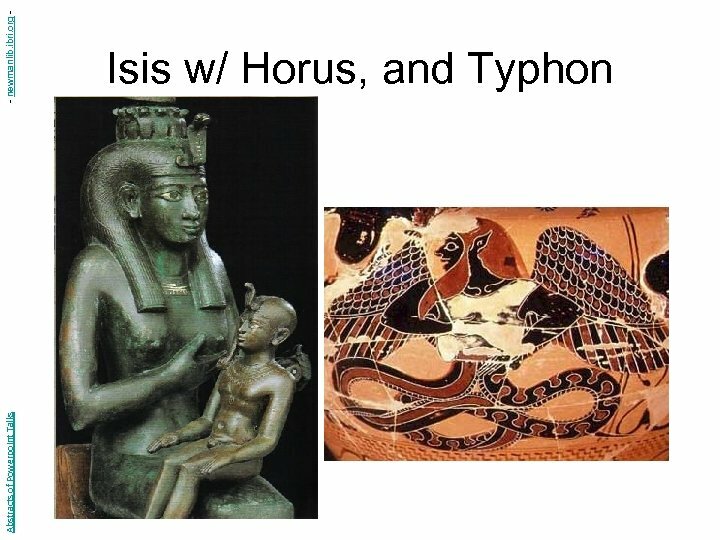 • The shape of the story is close to: – (1) The Egyptian myth of Isis begetting Horus, opposed by the red dragon Typhon, with Horus later killing the dragon. 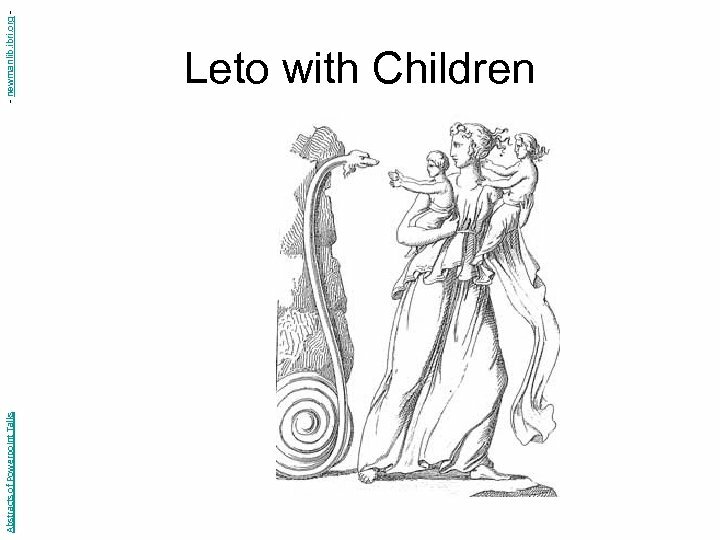 – (2) The Greek myth of Leto bearing Apollo, opposed by the dragon Python, and Apollo later killing it. - newmanlib. ibri. 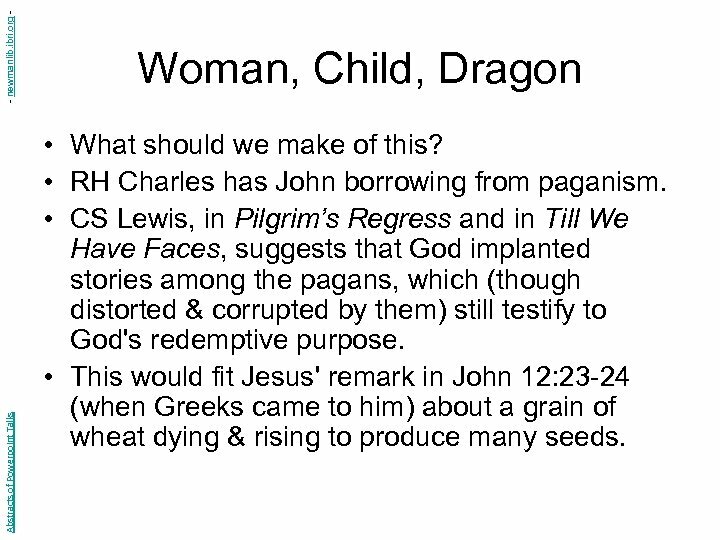 org Abstracts of Powerpoint Talks Woman, Child, Dragon • What should we make of this? 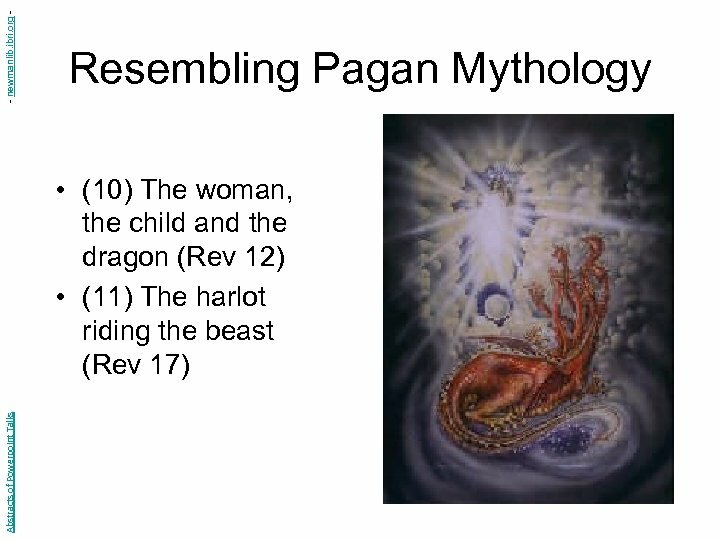 • RH Charles has John borrowing from paganism. 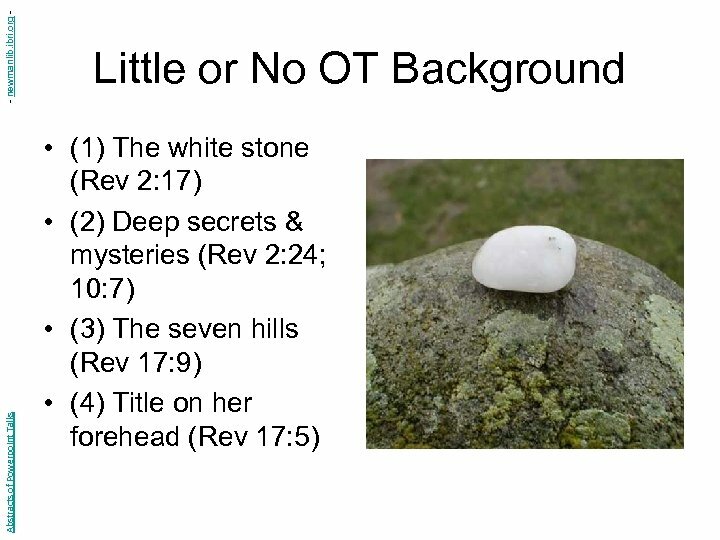 • CS Lewis, in Pilgrim’s Regress and in Till We Have Faces, suggests that God implanted stories among the pagans, which (though distorted & corrupted by them) still testify to God's redemptive purpose. • This would fit Jesus' remark in John 12: 23 -24 (when Greeks came to him) about a grain of wheat dying & rising to produce many seeds. - newmanlib. ibri. 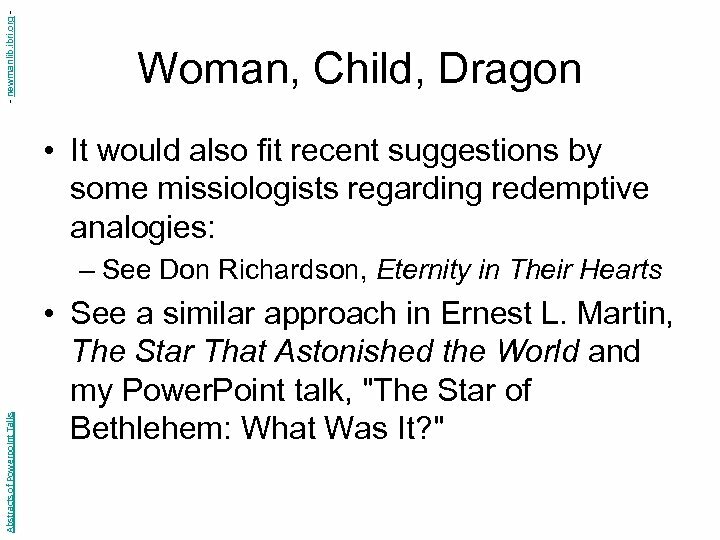 org - Woman, Child, Dragon • It would also fit recent suggestions by some missiologists regarding redemptive analogies: Abstracts of Powerpoint Talks – See Don Richardson, Eternity in Their Hearts • See a similar approach in Ernest L. Martin, The Star That Astonished the World and my Power. 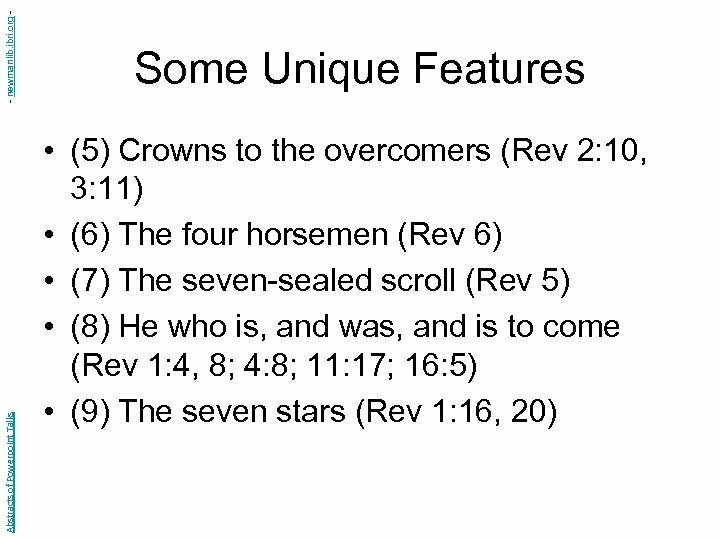 Point talk, "The Star of Bethlehem: What Was It? " - newmanlib. ibri. 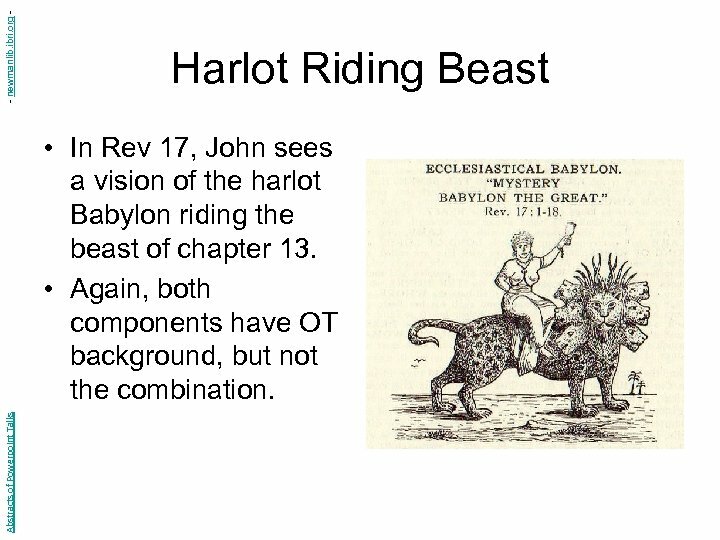 org - Harlot Riding Beast Abstracts of Powerpoint Talks • In Rev 17, John sees a vision of the harlot Babylon riding the beast of chapter 13. 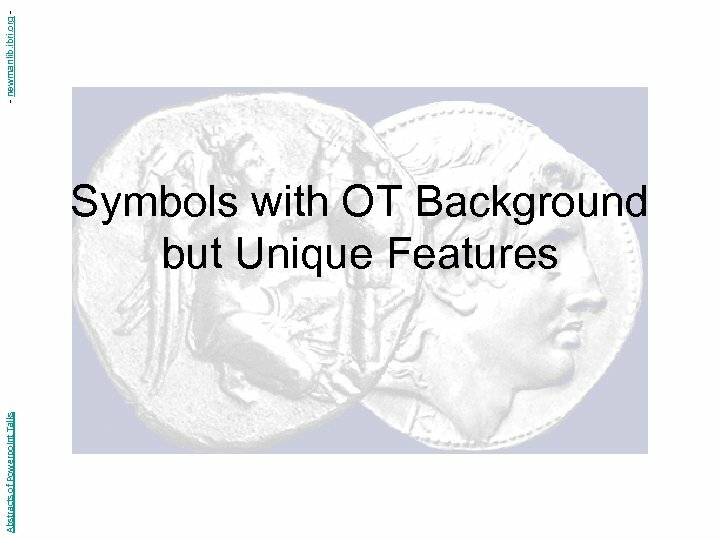 • Again, both components have OT background, but not the combination. - newmanlib. ibri. 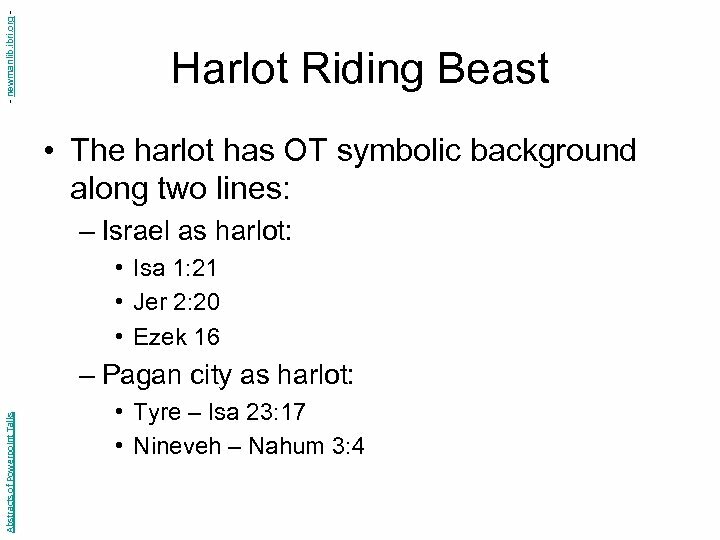 org - Harlot Riding Beast Abstracts of Powerpoint Talks • The riding motif does not occur in the OT. 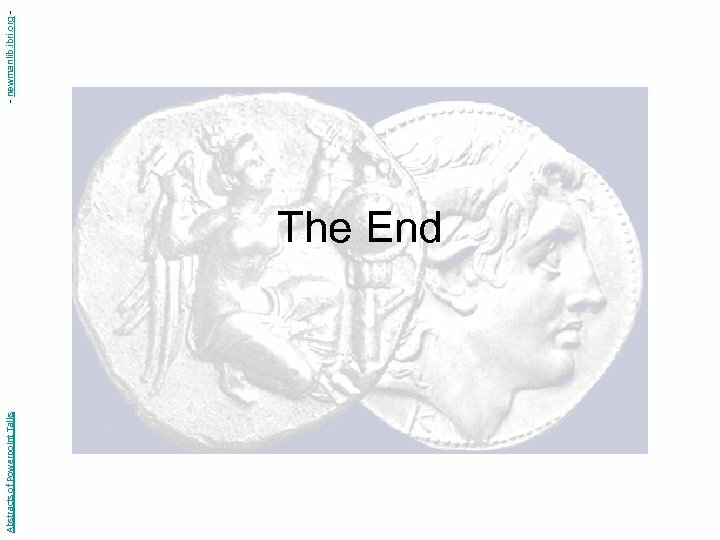 • But in Greco-Roman mythology, there is a striking parallel in the Europa myth. 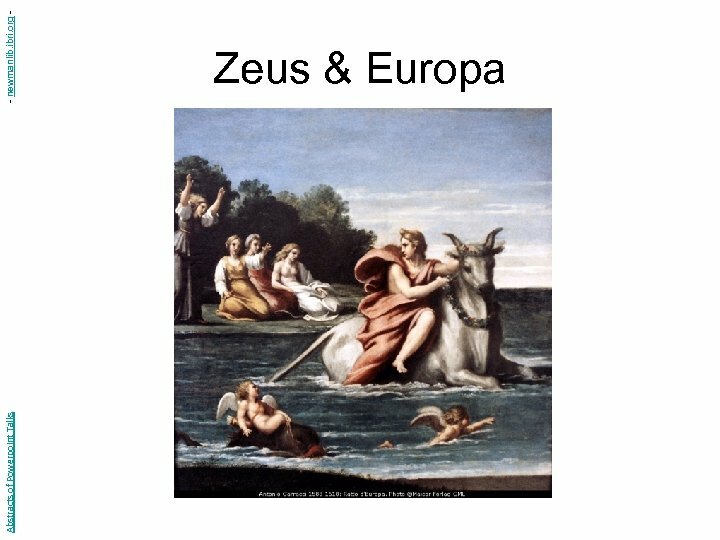 According to Apollodorus and Ovid: – Zeus sees Europa, daughter of a Phoenician king, playing with her friends at the seashore. 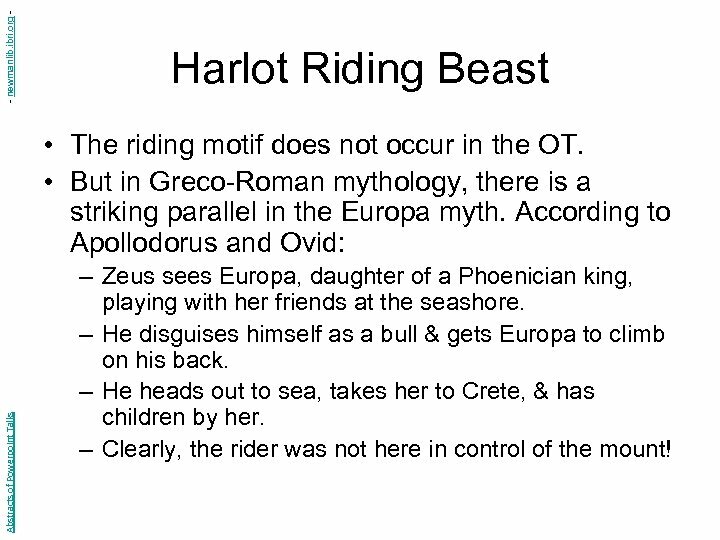 – He disguises himself as a bull & gets Europa to climb on his back. – He heads out to sea, takes her to Crete, & has children by her. – Clearly, the rider was not here in control of the mount! - newmanlib. ibri. 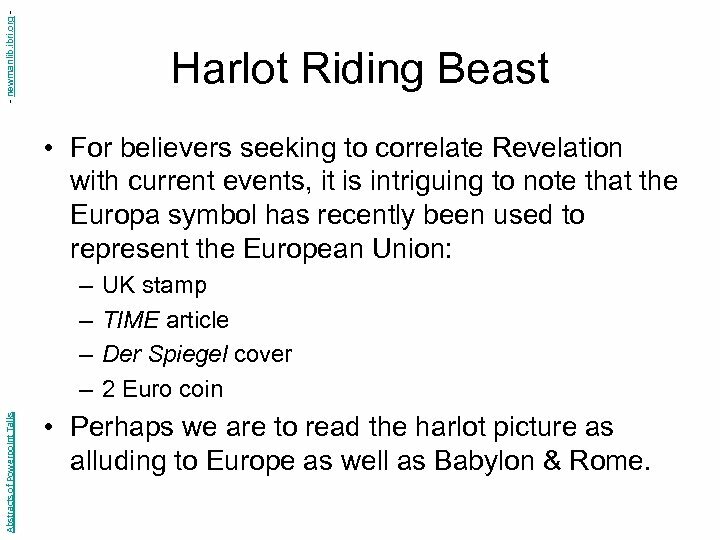 org - Harlot Riding Beast • For believers seeking to correlate Revelation with current events, it is intriguing to note that the Europa symbol has recently been used to represent the European Union: Abstracts of Powerpoint Talks – – UK stamp TIME article Der Spiegel cover 2 Euro coin • Perhaps we are to read the harlot picture as alluding to Europe as well as Babylon & Rome. - newmanlib. ibri. 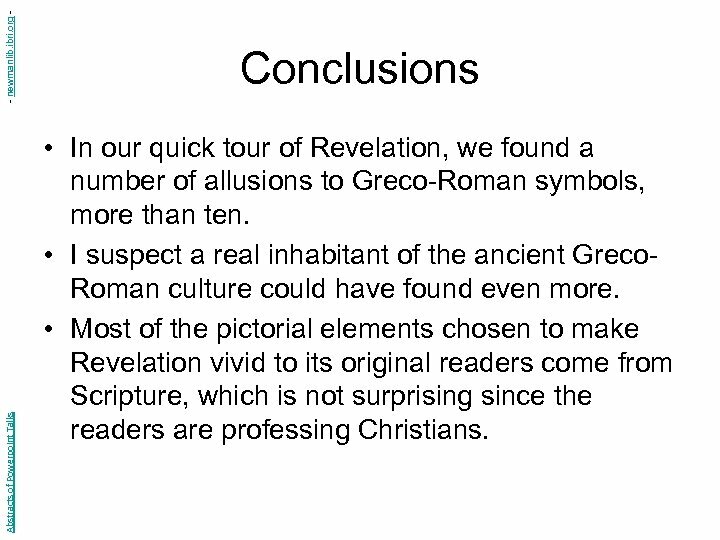 org Abstracts of Powerpoint Talks Conclusions • In our quick tour of Revelation, we found a number of allusions to Greco-Roman symbols, more than ten. • I suspect a real inhabitant of the ancient Greco. Roman culture could have found even more. 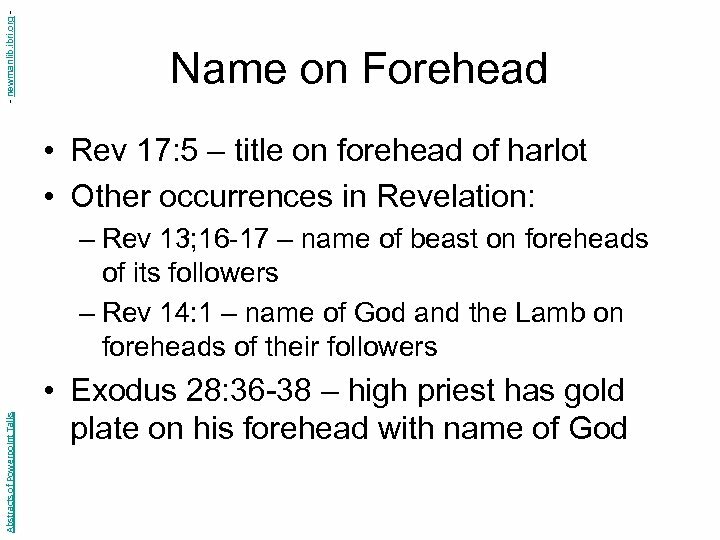 • Most of the pictorial elements chosen to make Revelation vivid to its original readers come from Scripture, which is not surprising since the readers are professing Christians. - newmanlib. ibri. 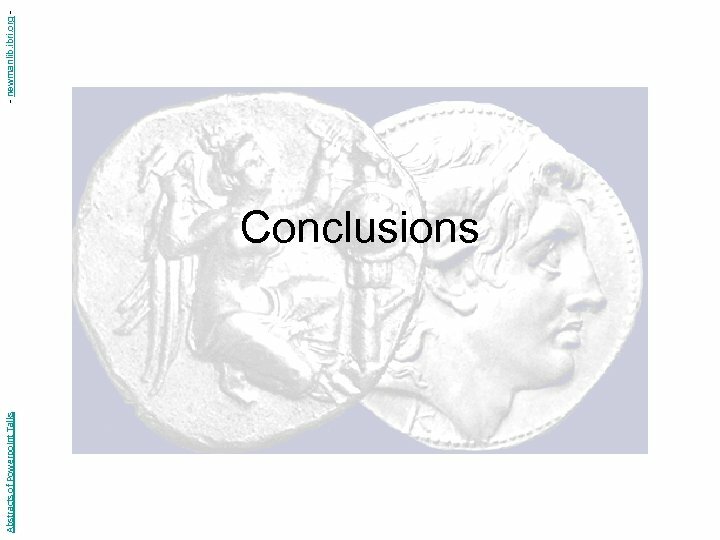 org Abstracts of Powerpoint Talks Conclusions • Yet a significant number are from their background Gentile culture, and some even from pagan mythology. 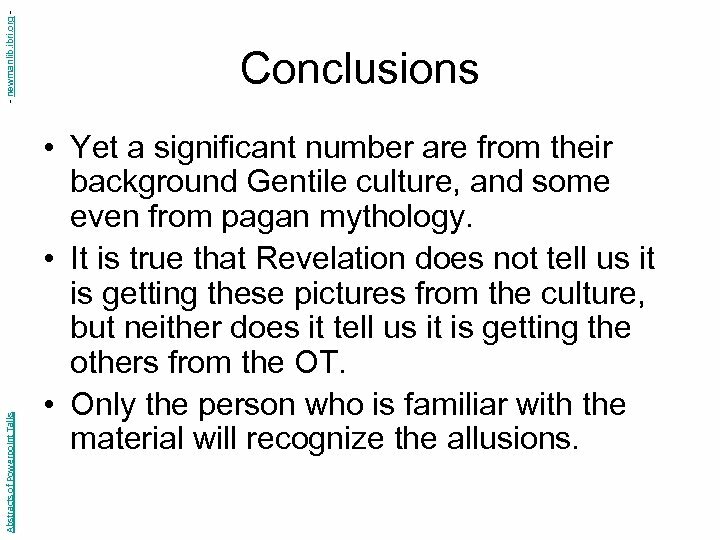 • It is true that Revelation does not tell us it is getting these pictures from the culture, but neither does it tell us it is getting the others from the OT. 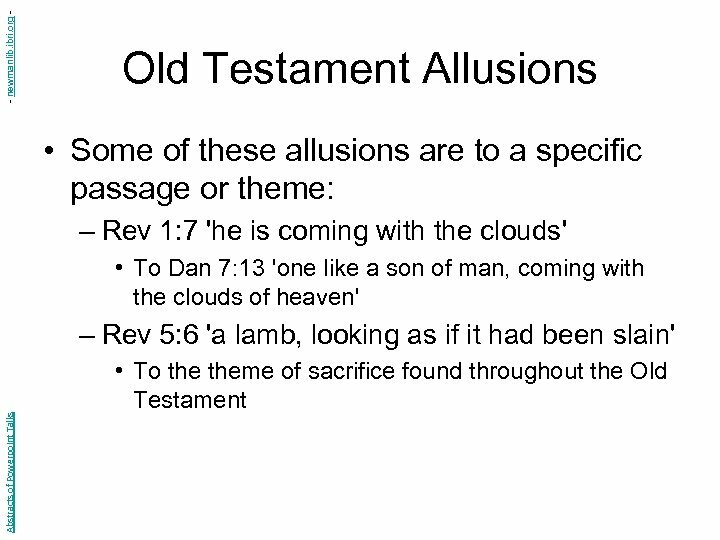 • Only the person who is familiar with the material will recognize the allusions. - newmanlib. ibri. 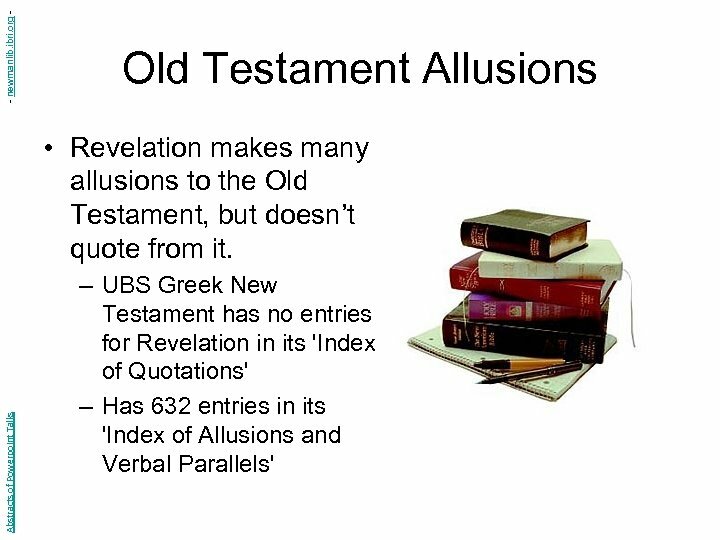 org Abstracts of Powerpoint Talks Conclusions • Regarding the question of contextualizing the Gospel, the example of Revelation needs to be factored into our thinking. 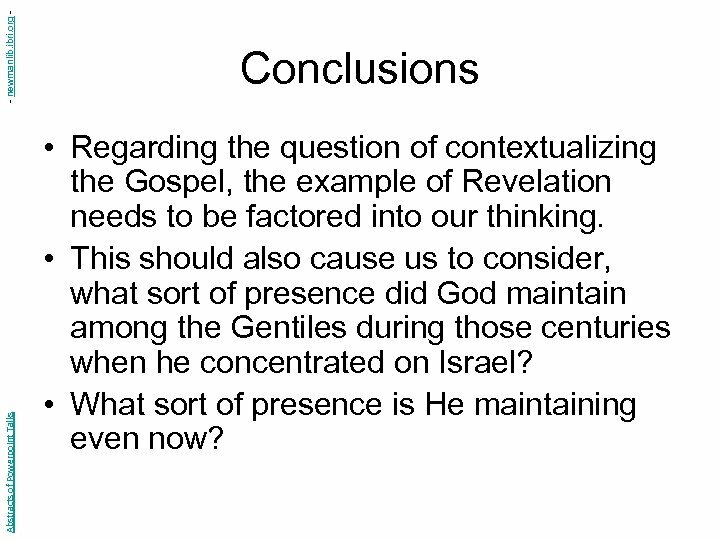 • This should also cause us to consider, what sort of presence did God maintain among the Gentiles during those centuries when he concentrated on Israel? • What sort of presence is He maintaining even now? - newmanlib. ibri. 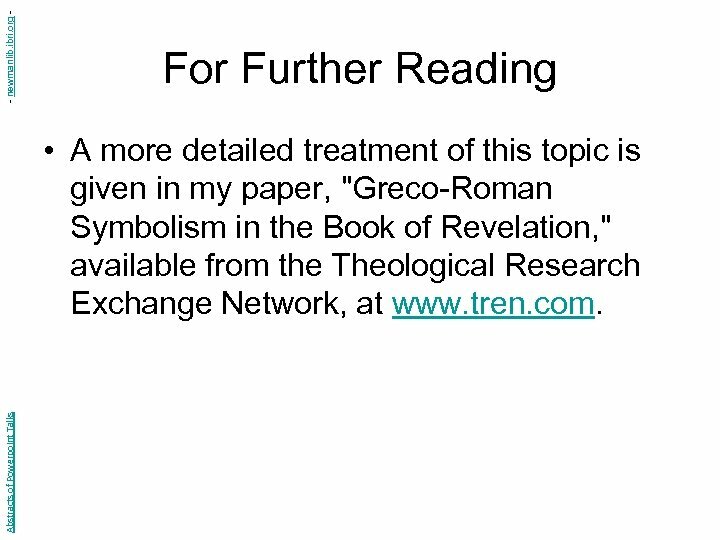 org - For Further Reading Abstracts of Powerpoint Talks • A more detailed treatment of this topic is given in my paper, "Greco-Roman Symbolism in the Book of Revelation, " available from the Theological Research Exchange Network, at www. tren. com.